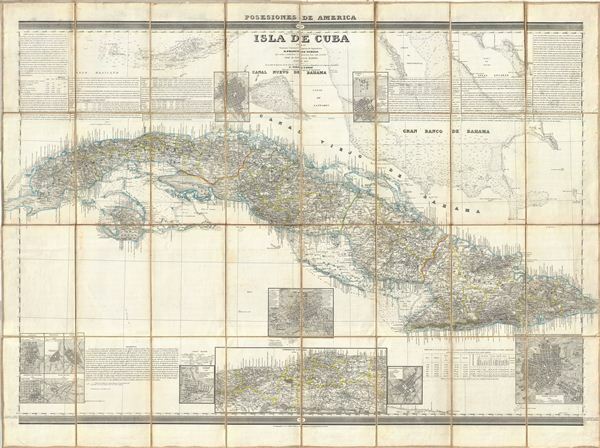 The finest map of Cuba to appear in the 19th century. A fine example of Francisco Coello de Portugal y Quesada's massive 1853 map of Cuba. Coello's map is the first scientifically produced Spanish map of Cuba and is presented on a previously unseen scale. The topography is the work of Camilo Alabern and the map was drawn by Pascual Madoz. The map features 11 inset regional plans including 8 detailed city plans with streets and individual buildings identified. Parts of the Grand Bahama Bank and Florida Keys are also noted. There are countless depth soundings as well as extensive textual annotations throughout. Engraved in Madrid for Coello's unfinished opus Atlas de EspaÃ±a y sus posesiones de Ultramar. There are two different issues of this map, the deluxe dissected issue, as seen here, and a standard issue folded example. Coello, F., Atlas de España y sus posesiones de Ultramar, (Madrid) 1853. Rumsey 5011.001. Phillips (Atlases) 9323, 3137.